The quite village of Finikia is located on the north part of Santorini, 10 kilometers northwest of the capital Fira, very close to Oia settlement. Finikia is one of the many beautiful settlements in Santorini. The scenery at Finikia is gorgeous, so it is a good choice to spend a night at one of its hotels or villas to rent in this wonderful village. Messaria is a pretty lively and small vineyard village awash with cave houses and mansions. It is located 4km southeast of Fira and is easily accessible. Don’t miss the chance to visit the two wineries, as Santorini boasts a long wine-making tradition and fine wine varieties thanks to the volcanic soil. Also, there are various hotels and apartments to rent for every budget. Megalochori: A historical village to explore! Megalochori is located only 7 km from Fira and has a rich history of merchants and wealthy land barons exporting the Vinsanto and the Asyrtiko wine that the island produces. Around the main square of this picturesque vineyard village, are taverns and cafes to enjoy your food and local wine. Due to its beauty and location a fair number of tourist choose Megalochori to explore. 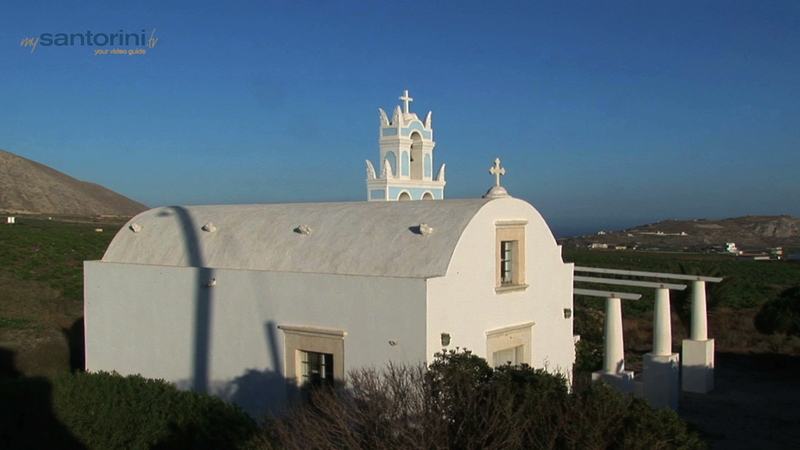 Pyrgos is the highest village of the whole island, providing great panoramic views of both sides of the island. It is located only 6km away from Fira and it is easily accessible by car or by local transport. The village consists of traditional houses built around the Venetian castle. In Pyrgos you have several option for accomodation consist of traditional houses, hotels, villas to rent with astonishing views. Exo Gonia is located at the southeastern side of Santorini close to Pyrgos village, almost 8 kilometers away from the capital Fira. It combines old and modern houses and manor houses. Moreover, Exo Gonia considered to be the monastic centre of Santorini, due to the fact that has really beautiful monasteries and churches. The accommodations of the village is restricted, so if you want to stay at this wonderful place, you have to book early. Emporio is Santorini’s largest village, which attracts visitors with its rare beauty, around 10km away from Fira. The village is a picturesque settlement with beautiful houses and yards and it has been the traditional trade center of the island for centuries. If you choose Emporio for your stay there are luxury hotels and villas for rent, plus charming traditional houses and rooms. Perissa is a sea-front fishing village, which is located 12,5 km away from Fira the main town of Santorini. It is accessible by car or by local transport. The reason most visitors come to Perissa is the attractive black lava sand of the beach. Also, it has received the Blue Flag Award. There is a plenty variety of accommodation choices, hotels, villas to rent, rooms to let, plus numerous restaurants to enjoy fresh fish. Kamari, is a cosmopolitan resort, which is located 8 km. away from Fira, the main town of Santorini. The clear waters of the Kamari beach gave away the prestigious Blue Flag. Morever, you can visit Ancient Thira, which is above Kamari. There are buses available to take you to the top, or you you can walk. For your stay at Kamari there is a big variety hotels, rooms to let and villas for rent. Karterados is a peaceful scenic village, which lies almost at the center of Santorini, only 3,5 km from Fira. It is easily accessible by car, by taxi or by local transport. There is a plenty of restaurants and cafes where you can enjoy your food and drink. Also, the are many accommodation choices, with a variety of villas for rent, hotels and apartments.